BAGHDAD, Iraq (CNN) -- President Bush said Thursday that he wished Saddam Hussein's execution had "gone in a more dignified way." The remark was Bush's first on-camera response to the chaotic scene captured in a cell-phone recording of the former Iraqi dictator's hanging. "But nevertheless, he was given justice," the president added during a news conference with visiting German Chancellor Angela Merkel. "The thousands of people he killed were not." "One thing is for certain," Bush said. "A horrific chapter in Iraqi history has been closed." Meanwhile Thursday, four decapitated bodies were among the 47 bullet-riddled corpses found around Baghdad as car bombs and mortar attacks killed 20 more people in and around the city. Police said the four decapitated corpses were found in the Ghazaliya area of western Baghdad and that most of the 47 bodies showed signs of torture. Separately, two cars packed with explosives and parked behind a gas station in western Baghdad exploded Thursday morning, killing at least 13 and wounding 22 more, authorities said. The twin car bomb blasts occurred in quick succession shortly after 10 a.m. (2 a.m. ET) as civilians waited in line to buy heating fuel in the Mansour neighborhood of western Baghdad, according to police. In addition to the bombs, a mortar attack northwest of Baghdad, in Saba al-Bour, killed one civilian and wounded six others, an interior ministry official told CNN. Another mortar attack on the Shiite neighborhood of Amel in western Baghdad killed five civilians and wounded four, the official said. The violence and Bush's remarks came amid criticism of the Iraqi government's handling of Hussein's execution Saturday morning. Two co-defendants, Barzan Hassan, Hussein's half-brother, and Awad Bandar, the former chief judge of the Revolutionary Court, also face execution by hanging. Like Hussein, they were found guilty in the 1982 massacre of 148 people in Dujail, Iraq. On Wednesday, U.N. Secretary-General Ban Ki-Moon endorsed U.N. human rights chief Louise Arbour's appeal to the Iraqi government not to carry out the men's death sentences. No date has been set for their execution, but it will take place after the Eid al-Adha holiday, which ends Sunday. The father of an abducted security contractor said his family was heartened by a videotape of the kidnapped man. Jonathan Cote was kidnapped along with four other American security contractors and an Austrian co-worker during an ambush in the southern Iraqi town of Safwan on November 16. Both verified the date of the tape, which carried the date stamp of December 21. "We felt very good because this is evidence of a recent tape," said Cote's father, Francis Cote. "Jonathan had a month's worth of beard, and looked good with no injuries. This is good news." The family has not held any news conferences, for fear of jeopardizing negotiations. In the video, which lasts nearly 1½ minutes, each man makes a similar plea: that U.S. military forces leave Iraq. In places, the audio quality is poor and the sound garbled. CNN's Jomana Karadsheh, Brian Vitagliano, Carol Brown and Octavia Nasr contributed to this report. 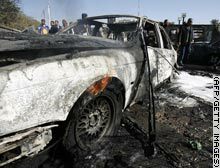 Flames burn after a car bomb exploded and killed more than a dozen people near a gas station in western Baghdad.